Grease a non stick dish and set aside. Keep stiring till 2 minutes till they are well combined and blended. Now add sugar, cardamom powder ( optional) and again cook on low heat. Make sure you keep stiring for 6 to 7 minutes until the mixture is well blended and turns into a little thicker paste. It will start leaving the pan too which indicates that the mixture is ready. The mixture should not be extra hard neither too soft. If it becomes a smooth ball that means your mixture is ready. Take out the mixture in the greased pan and spreadout uniformaly. 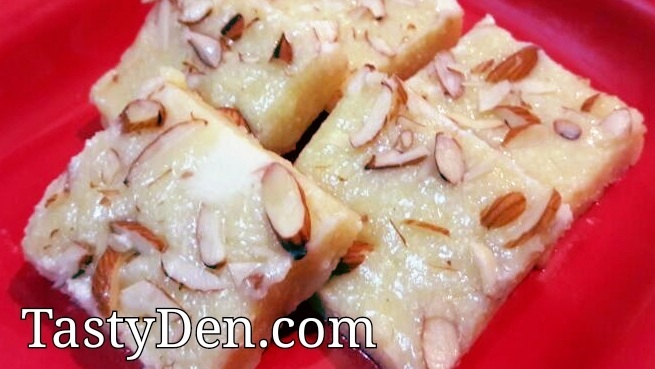 Add chopped pistachios and almonds on the top and press gently so they set well in the burfi. Cover with cling wrap and leave aside to cool down completly. If you are in a rush you can put it in fridge too. When it is cooled down properly. 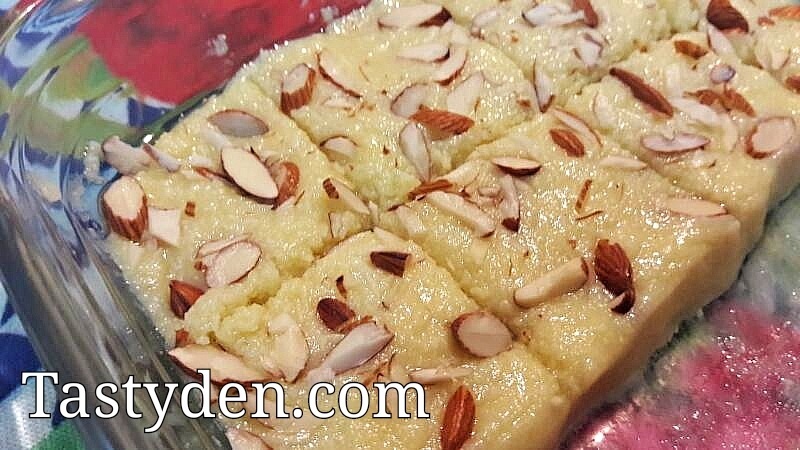 Take a knife, apply some ghee on it and cut it in to any shape of your choice. They are ready to serve now.